I rarely, if ever get asked to deliver an off-the-shelf training course. I usually get asked to help Call Centres, Tele-Sales Teams or Small Businesses in the UK to help them with their Outbound & Inbound Cold Calling strategy or to increase inbound or outbound sales over the phone or Lead Generation or Customer Retention or Customer Service Calls. Few ask for Off The Shelf Sales Training Courses, I tailor each module to suit the needs of every individual client and/or department. I discuss the challenges my client faces and come up with a tailored and bespoke training course for their specific needs. The list of courses below just form the basis of some the courses that I offer – from that I work closely with my client and their team to design a specific course to help them resolve the challenge/s that they face. Below you will find a list of short modules that, depending on client requirements, I combine to put together a specific programme. 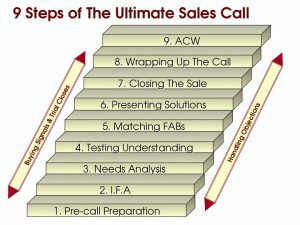 However, the image on the right is one of my most popular programmes which is a great programme for anyone making Inbound or Outbound Sales Calls -. this can be covered in one day or better still over 2 days so that lots of role plays can be done to fully embed the delegates learning. 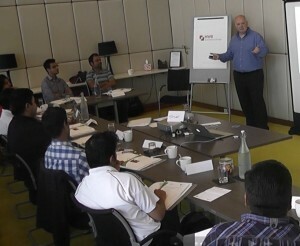 This Telesales course is ideal for those who want to improve their follow-up calls to maximise sales. It will help those handling inbound enquiries to increase their sales conversion rates. It will increase confidence in making outbound calls professionally, increase the delegates ability to handle objections effectively, develop own individual style and improved their follow-up call techniques.